Found 2 file extension associations related to Office Customization Tool and 2 file formats developed specifically for use with Office Customization Tool. The OCT (Office Customization Tool) is part of the Setup program and is the recommended tool for most customizations. You run the OCT by typing setup.exe /admin at the command line from the root of the network installation point that contains the Office 2010 source files. For example, use the following: \\server\share\Office14\setup.exe /admin. The OCT is available only with volume licensed versions of Office 2010 and the 2007 Office system. 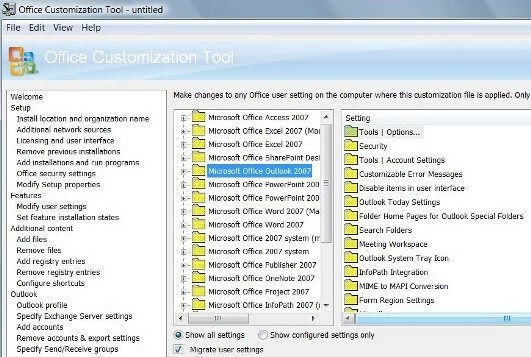 To determine whether an Office 2010 installation is a volume licensed version, check the Office 2010 installation disk to see whether it contains a folder named Admin. If the Admin folder exists, the disk is a volume license edition. If the Admin folder does not exist, the disk is a retail edition. If you need more information please contact the developers of Office Customization Tool (Microsoft Corporation), or check out their product website.